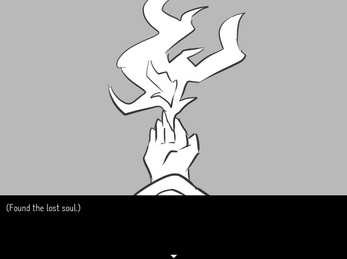 A soul with a strong power is reincarnated as a reaper. 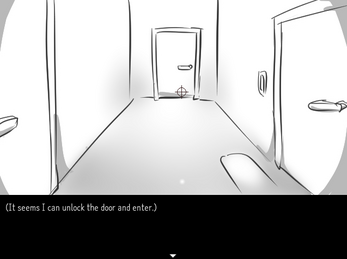 Our protagonist, the reaper, goes in a house to save a soul. *The game contains a few number of kanji(漢字), these may not display properly on western computers. *Contains cute artstyle, depressing story, and a cute omake room. Also contains topics of death. 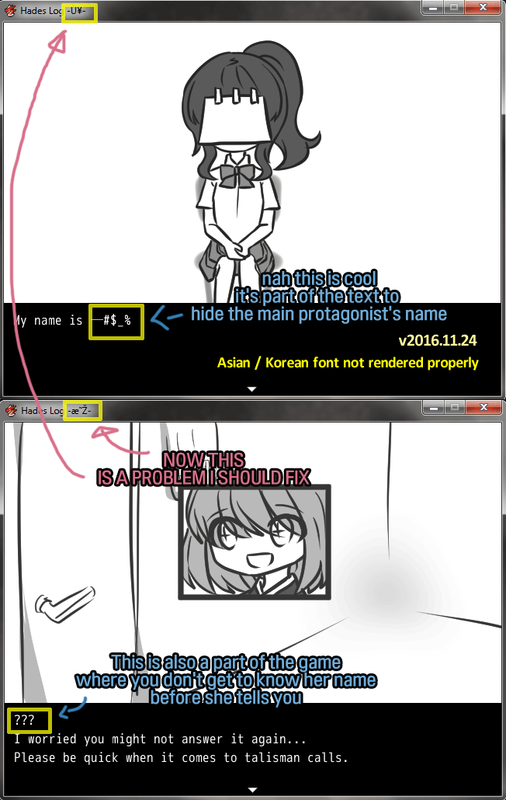 11.27.16 : Tampered with a few dialogues, and removed the 明 in the window title. 12.02.16 : Changed mp3 BGMs to oggs! Now the music should play correctly. 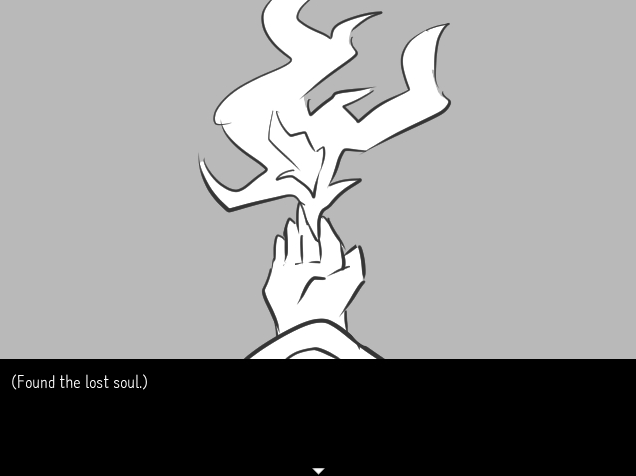 Also fixed the cursor being visible in the opening screen for a split second. 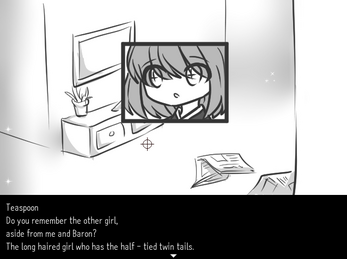 The game requires RPGMaker VX RTP. You may download the RTP separately or use the 'Hades Log_with RTP' download. Hey there! 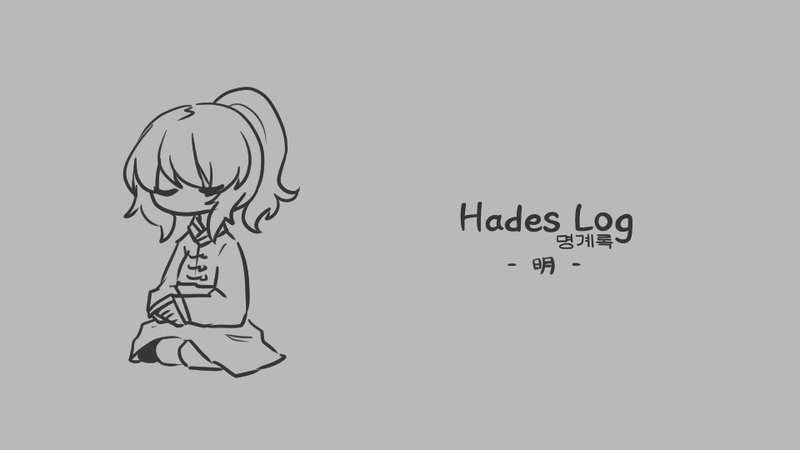 I played Hades Log and really enjoyed it! = )I also did a let's play on YouTube for it, I hope this is ok? What's the MEW file? And whats the password to extract the files? v2016.12.02 Changelog: "Changed mp3 BGMs to oggs! Now the music should play correctly." 1) I think you accidentally overlooked the MP3 file in \Audio\SE\. Basically, what I did was convert all non-OGG audio files (in \Audio\BGM\ & \Audio\SE\) to OGG (constant 128 kbps), so as to achieve smaller filesize & maximum system compatibility. 1. 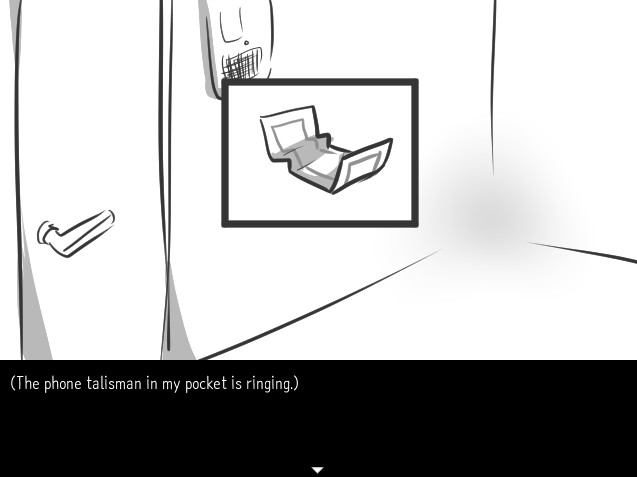 My only purpose was to make the music play and I didn't wanted to touch anything other than that (mainly because I'm very lazy...(._. ) The sound plays properly and that's all that matters. 2. The Key Item feature is one of the default features in RPG Maker tool, I guess the main author intended to use it but didn't during the game development. Now for the game "review" proper ... First of all, thanks for the game's English translation & bringing the game to a wider audience. Before trying the game, I had no idea what it was about. But playing the game (various times, albeit for troubleshooting reasons) gave me a poignant sense of déjà vu. Very coincidentally, during the past few months at my location, there have been a spate of incidents exactly related to the game's themes. The 2 most recent incidents occurred 2 days ago & 1 month ago respectively. Also, I don't know if the game does offer multiple endings, but since it always plays & ends the same way for me, it does feel that nothing I or the Reaper-protagonist do would make any difference at all. I found that the game has 3 endings, or 3.5 endings (... depending on how one regards the very wacky Bonus Room). For those interested in the cultural background, here's a recent news article about the societal issues discussed within the game: South Korea's Testing Fixation (The Atlantic - 17 Nov 2016). 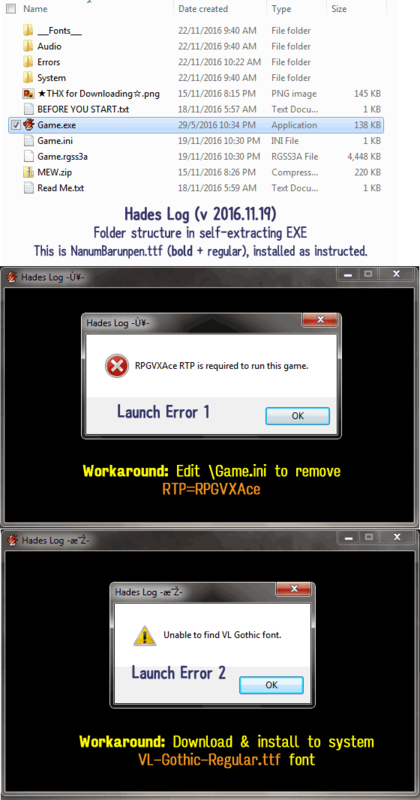 The 19 Nov 2016 upload of Hades Log can't be played, despite having followed the instructions (ie. install the 2 supplied NanumBarunpen.ttf fonts). Launch Error 1: "RPGVXAce RTP is required to run this game"
which I resolved by removing the line "RTP=RPGVXAce" from \Game.ini. Launch Error 2: "Unable to find VL Gothic font"
which I resolved by downloading & installing VL-Gothic-Regular.ttf. Screenshots for the above 2 errors. The aforementioned is then followed by a runtime error after clicking 'New Game' at the opening screen: "Unable to find file: Graphics/Tilesets/Inside_A1" (animated GIF screenshot). The last error results in a dead end, since there is no \Graphics/Tilesets/Inside_A1\ subfolder within the game folder. 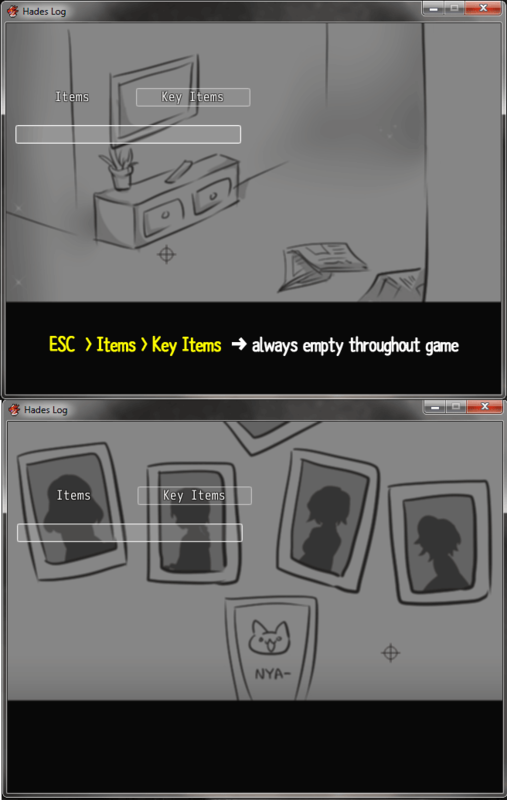 Oddly enough though, there is a password-protected \MEW.zip (containing mew.png) at the root of the game folder. Could you upload a working version ? I look forward to playing the game, hopefully without having to install anything else or keep jumping through the various hoops of Hades. Thanks ! if this solution does not work, I will have to contact the original author. 1) The 24 Nov 2016 upload (Hades Log_with RTP.exe, 217 MB) works, but not because the extracted folder contains RTP.exe (there is none). As mentioned, RPGMaker VX RTP (RTP.exe alone or the installed package) is not required to play the game, as long as \Game.ini does not contain the line "RTP=RPGVXAce". 2) The 217 MB upload works because it contains the graphics & audio files needed by the game. However, the upload also contains lots of redundant files not used by the game. If you wish to make the game folder much smaller (48 MB uncompressed, ~26 MB compressed), I've provided a list of the essential files here. I discovered that these files are absolutely essential by running the game numerous times without the required graphics & audio files, & then sequentially checking what files the game complains as missing. 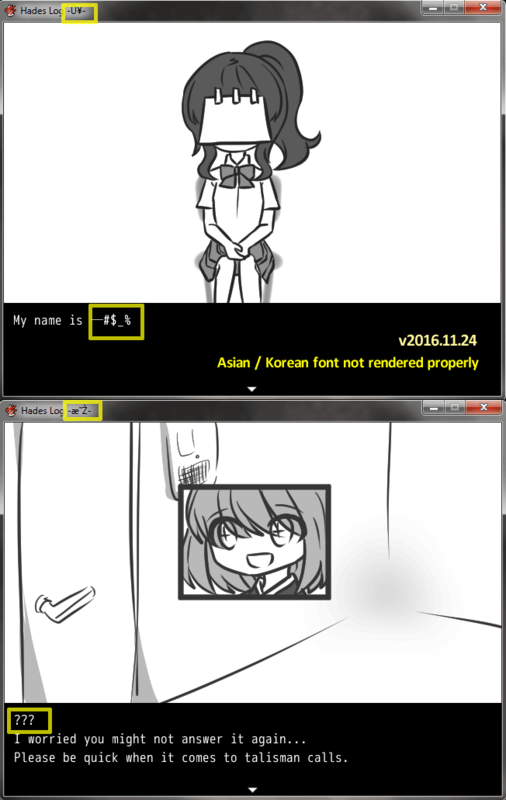 a) Asian font is not rendered properly in the game's titlebar & gameplay's text. The game's Asian font is displayed as "???" or a random string of symbols (eg. -#$_%) or rubbish characters (screenshots). My OS localization is English, but my Windows Font folder contains various Unicode font-types that can render Kanji & non-Kanji Asian fonts. For instance, I can type, save & display the Kanji character 明 (myeung) in my system with no problems. As such, the problem might be due to the game translation script or file not being compiled/ saved with UTF-8 encoding. For instance, I noticed that the \Read Me.txt file contains rubbish characters as well, but re-saving the file with UTF-8 encoding on my side does not help. The encoding was not preserved on your side. 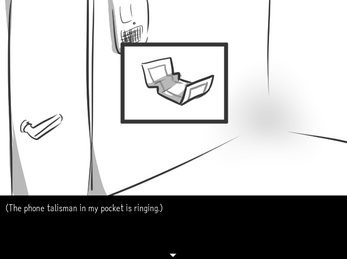 b) I can hear the various sound effects (eg. resulting from to menu action), but is there music in the game ? There are stretches of silent black screen lasting a few seconds each throughout the game. 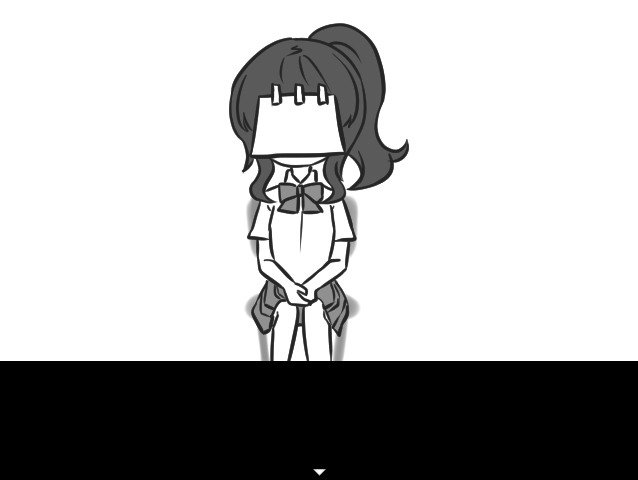 I'm guessing these silences could be music instead, since the game needs at least 5 audio files (music type, not sound effects) in the \Audio\BGM\ folder. Or maybe the "baek" memory-recall scenes have music as well ? 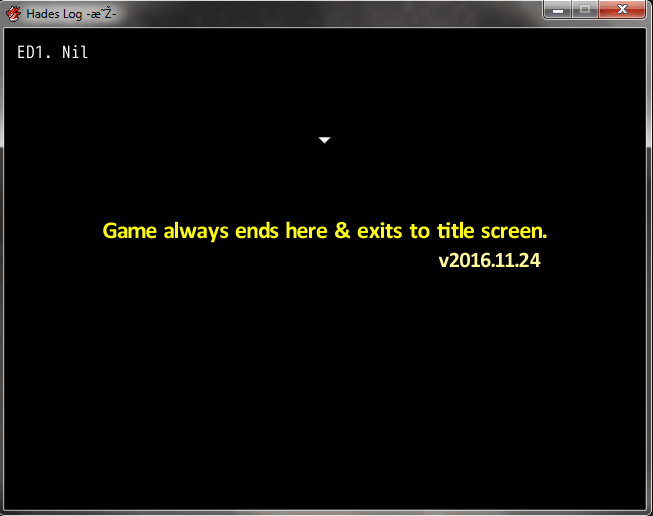 c) Although the game is tagged "Multiple Endings" on this page, the game always progresses the exact same way & ends with a black screen showing "ED1. Nil" (screenshot), regardless of which in-game option I choose. 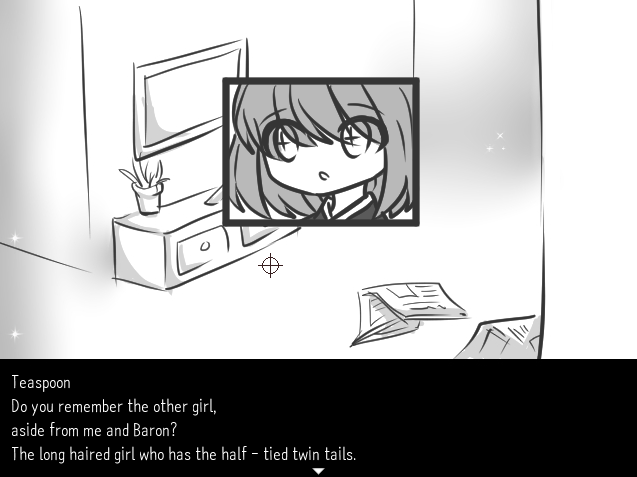 Is there more than one ending ? 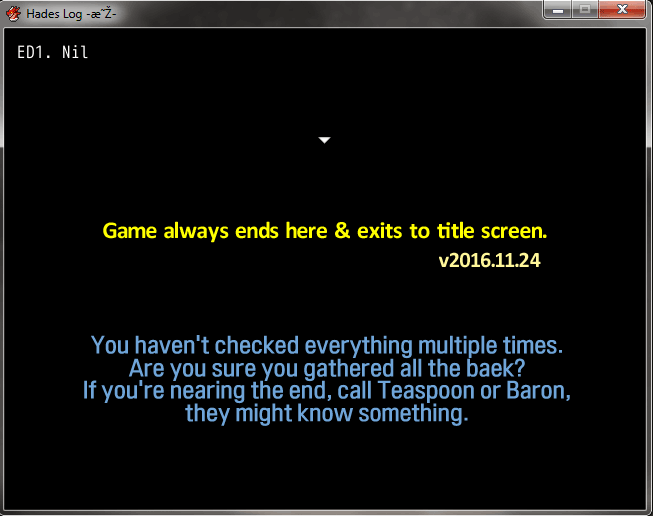 If yes, I can't seem to get to the other endings. d) The game is also tagged "Point & Click" here. But the mouse click doesn't work in the game. I have to use the arrows, ENTER & ESC keys on the keyboard. First of all, I should inform that I am not a professional translator. The game's resource, for some reason, still requires the RTP data. this is going to be the safest, yet not really the best option. a) There is nothing I can do with the UTF-8 related stuff; I am no expert when it comes to those sort of things. Deleting the 明 was the simplest solution, since it wouldn't make a huge difference. b) Is there really no music? There should be. Something's wrong there, is everyone having the same issue? 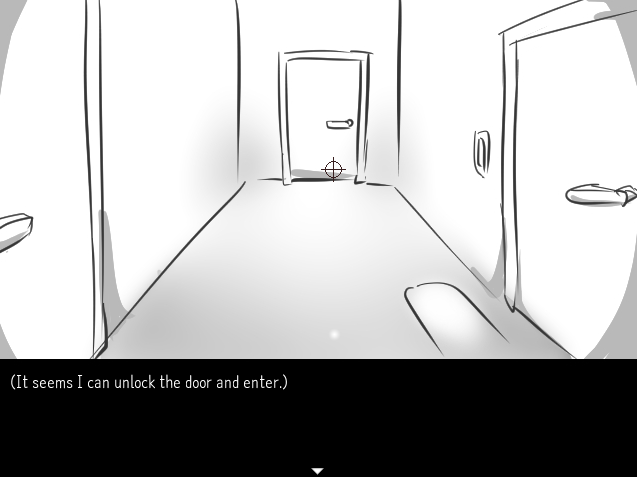 d) Yes, I was hesitant to put the 'Point & Click' tag at first, but despite the game not using any mouse controls, the game uses the same system as a point&click game. This... should be fine, right? The game files should be updated shortly. 1) Still no music here (Win 7 x64) during the gameplay, other than menu-triggered sound effects. The music mp3 files in the game's folder play fine in an external player though. 2) I managed to reach an alternate ending that concludes with "ED2. Empty" on a black screen, followed by the game credits. But I'm guessing there should be more alternate endings, so I shall try again. 3) Upon reaching this screen with the Hanja ("Kanji") characters, I suddenly "see the light" regarding the homonymic & visual puns in the game's name, which also brings to mind the bright memory baek & the shiny points of light used in the game mechanics, whilst simultaneously foreshadowing the dark theme of the game. I think this is great ! 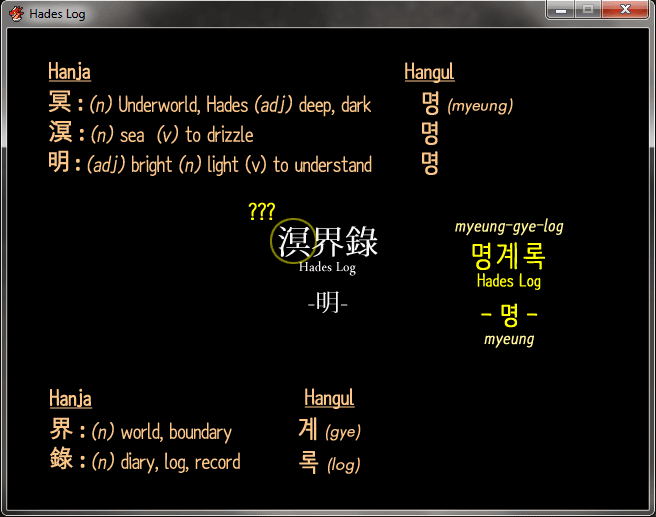 On a curious note though, isn't the Hanja character for Hades/ Underworld 冥, instead of 溟 (sea, to drizzle) as shown on the game's screen ? Although both characters are written & pronounced as 명 (myeung) in Korean Hangul, their meanings are totally different. I have contacted the author Nishi and they quoted : "The sound problem doesn't happen in the Korean version, so I do not know how to fix it." and "The reason why I used 溟 instead of 冥 is because the Hades, even though it's an afterworld, it's not all dark and depressing. That's why I didn't used 冥 which means dark." I've also looked up to see if the music problem had anything to do with Korean characters, but that doesn't seem to be the case. So I really don't have any clue how to fix it... (._. There's really no need to package the entire RTP Gamemaker resource ("data") files (>200 MB) for users who don't have RTP installed. Hades Log definitely does not require all the stock resource files found in RTP Gamemaker. Based on the final compressed filesize (~28 MB exe) consisting of only the game script & essential resource files, you don't even have to upload 2 different builds. Just import only the resources actually used by the game into the game's project folder, make sure Game.ini doesn't have that "RPGCXACE" reference, & don't tick "Include RTP Data" during game compilation ("Compress Game Data"). In doing so, you aren't "messing around" with the game files, but only sieving out the necessary ones for the benefit of end users, as well as yourself in terms of uploading time & bandwidth. For instance, do you think Hades Log requires hundreds of redundant RTP "data" files such as monster/ battlefield sprites or scream/ wolf/ quake audio files ? You don't have to take my word for it. You can check out some RTP Gamemaker user references collated here on how to compile a more lightweight RTP game for distribution. And here is a list of absolutely essential Hades Log game files as required on a system without RTP installed (& assuming no Korean fonttype installed either). If manually sieving out the essential game resource files is too tedious, you can examine this pared-down Hades Log game file & test-play it on a machine without any RTP installed: HadesLog.exe (28 MB self-extracting EXE, expiry: 50 days after last download, VirusTotal report: 0/68 detections). I'd played through the entire game several times using this downsized game package, so it definitely works even though I don't have RTP Gamemaker on my system. Note: I had also re-saved the game's \Readme.txt with UTF-8 encoding after replacing the garbage characters with their Hangul equivalents sourced from the Korean version (나를 읽어라.txt). It doesn't affect the game, it only makes the TXT file more readable (ie. as opposed to having lots of garbage characters). Cheers !